As part of Heritage Open Days, the Deal Society are leading a walk on Sunday 11th September. This walk of about an hour will give a flavour of the maritime history of Deal and, in particular, the links between the military presence of the town and its prosperity. It will feature tales of some of the characters who helped shape the history of Deal and explain how a town with no natural harbour came to be one of the most important ports in the country. 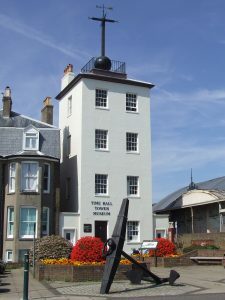 The walk will start at 1pm outside the Timeball Tower, finishing at about 2pm at the Maritime and Local History Museum. Both venues are open as part of Heritage Open Days and refreshments are available at the finish. If you wish to visit the Timeball Tower before the walk, please allow an hour for the visit it as it may be busy. The walk, and both museums, are free for this event and you do not need to pre-book – just turn up on the day.